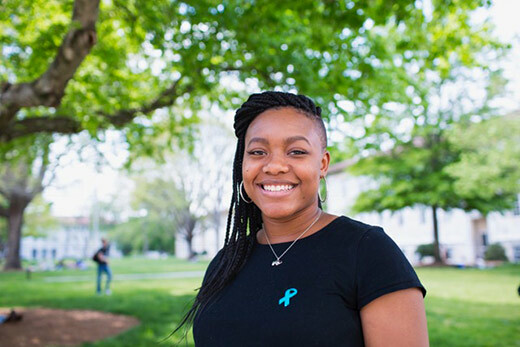 Emory University senior Chelsea Jackson is one of 32 American college students selected as a 2018 Rhodes Scholar. Jackson, a political science and African American Studies double major in Emory College of Arts and Sciences, is the university’s 20th student to be selected for the prestigious scholarship that provides all expenses for two or three years of study at the University of Oxford in England. She also is the fourth woman and first African American student from Emory College to receive the scholarship. Jackson has been heavily involved with the Emory chapter of the NAACP and co-founded the Atlanta Black Students United (ATLBSU), a group with black student representatives from every school in metro Atlanta. The ATLBSU remains a support system for students and resource for allies. She presented a conference paper last year with her adviser, Andra Gillespie, associate professor of political science and director of Emory’s James Weldon Johnson Institute for the Study of Race and Difference, that looked at how different backstories affected public opinion on police shootings. She was also named Emory’s first Truman Scholar since 2011. Jackson plans to earn a master’s degree in criminology at Oxford, home of a cutting-edge research center that focuses on the sociology of criminal justice. She hopes to examine how the law can be used to reform the criminal justice system by, for instance, reducing the use of solitary confinement and expanding the maternal rights of incarcerated women. “I want to learn how race and politics play out in other countries’ criminal justice systems to see how that shapes their world view, and to consider new ideas and ways to solve problems that I have not thought of yet,” Jackson says. After completing her Oxford degree, she plans to return to the U.S. to attend law school to become a civil rights attorney, either with the Department of Justice or a broad-reaching nonprofit focused on social justice. “The more empirical ideas I can learn, the more I can see how things are done elsewhere, it means I can be a better activist and propose better solutions,” Jackson says.